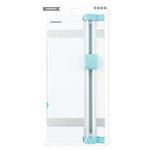 A paper cutter or paper trimmer is essential for scrapbooking. This tool is used to trim photos, cut paper to size, and to create borders for photos and pages. The cutter/trimmer helps to create perfect 90 degree cuts.